Welcome to 2015! We continue our retrospective of PHW in honor of our 50th Anniversary. If you missed earlier installments or need a refresher, you may find all the 50th Anniversary history posts under the tag 50th Anniversary. 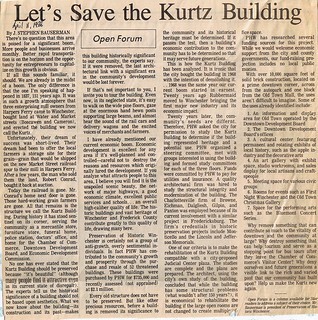 We continue now with PHW’s efforts to save the Kurtz Building. There were still concerns as to Frederick County’s unwillingness to relinquish an option to build on the site, though other Winchester Council members seemed to be swayed by the need for a downtown community center and a cultural arts space. 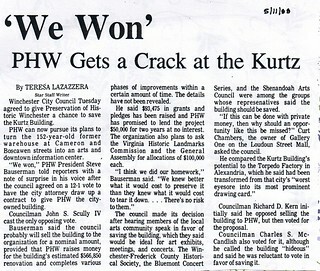 (7) It was enough, at least, to sway the Council to approve the plan, as in the event PHW could not perform the renovation, the Kurtz Building would return to the City and no money would be lost by the City on the endeavor.